Suits have the capacity to transform the looks of the children in a flash of a second. When a small child wears bespoke or readymade suit they will look extremely cute and beautiful. Children will always be in the limelight when they wear a world class suit that has bright design and colors. There are varieties of suits toddlers that come with appeasing designs and colors. 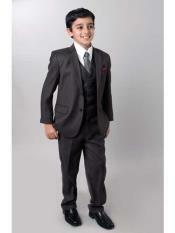 Kids will brim with extreme beauty when they wear a suit that has shiny materials and fabrics. Small children or toddlers will look handsome when they wear black colored two-piece suit that has solid lapels for the wedding or birthday party. Add value to the wardrobe by stuffing some of the finest kid suit that has glossy appearance. Normal kids will be transformed into fashion dudes when they wear ring bearer suit that comes in light brown color. Toddlers will carry celebrity look when they wear the jersey suit. Gift your children some world class toddler suits this season and make them happy. This jersey suit that comes in silver color carries a striking look and will be fit for all the seasons. Toddlers will carry a dynamic and charismatic look when they cover their tiny body with striped customized two-piece suit. Complement it with classic designer ties, white shirt and leather shoes. There are also set of formal wear for toddlers those who have stylish looks. Toddlers will look amazingly beautiful and like cute gentleman in the event when they wear blue cotton suit that has sweat absorbent materials. Infants will love wearing the suits that have rich colors and modern designs. • Six piece toddler black tuxedo boy suit: This suit has single breasted jacket with notch lapel, solid satin color, fully lined vest and other such features. This can be worn for special occasions like marriage and birthday. Pair it up with best accessories. •	Beigi khaki tan taupe formal suit: This elegantly stitched suit will be the best fit for formal events and it will show the child in the limelight. This ivory colored suit has long sleeve and comes with polyester and ivory mix. It has single breasted suit jacket which comes in different colors. Kids will always look pretty and attractive when they wear different types of clothing. If you want your child to be a bit showy then the right choice will be nothing but exotic suits. They will look trim and fit when they wear suits. They can also walk in the party wearing fully covered or with vest alone. Boys will look stylish when they wear best accessories like sunglasses, shoes and branded watches.